A 75-year-old man presented to our emergency department with a complicated medical history, including atrial fibrillation, congestive heart failure, and chronic pancreatitis. His chief complaint was shortness of breath and dizziness. Initial laboratory findings were significant for a low hemoglobin level (7.5 mg/dL). A review of his outside medical records indicated that, three months prior to this visit, he was found to have a hemoglobin level of 6.4 mg/dL and a left hemothorax. The hemothorax was attributed to spontaneous bleeding due to supratherapeutic anticoagulation from warfarin therapy for atrial fibrillation. Due to the history of supratherapeutic anticoagulation and anemia, a noncontrast abdomenal/pelvic CT was performed. The scan revealed a perisplenic hematoma and round low-density lesion contiguous with the upper pole of the spleen (Figure A). 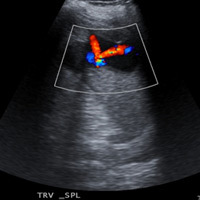 An ultrasound exam then was performed to determine the cystic or solid characteristics of the splenic lesion. A 4.6- X 3.9-cm anechoic lesion with two jets of arterial flow within it was found on color Doppler imaging, corresponding to the low-density CT lesion (Figure B). The patient was taken to the interventional radiology suite for transarterial coil embolization. The initial arteriogram was performed using carbon dioxide as the contrast agent. 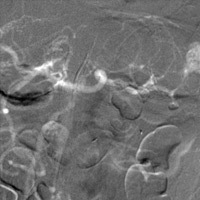 The intraparenchymal pseudoaneurysm was clearly demonstrated with small feeding arteries from proximal hilar branches (Figure C). Selective coil embolization of the feeding upper pole artery branch was performed. 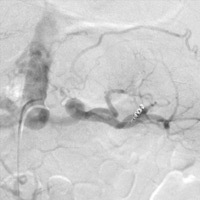 The angiogram done using iodinated contrast demonstrated complete occlusion of the pseudoaneurysm (Figure D). Traumatic or spontaneous rupture is treated with various methods, including splenectomy, transcatheter embolization, or conservative management.5,7 Increasing success rates have shifted endovascular treatment as first line therapy for splenic injury to conserve splenic function. — Heather J. Wichman, MD, is a radiologist in Denver, Iowa. — Venkataramu Krishnamurthy, MBBS, is an associate professor of radiology with the University of Michigan Health System and a radiologist with the VA Ann Arbor Healthcare System. Habib E, Elhadad A, Slama JL. [Diagnosis and treatment of spleen rupture during pancreatitis]. Gastroenterol Clin Bio. 2000;24(12):1229-1232. Görg C, Cölle J, Görg K, Prinz H, Zugmaier G. Spontaneous rupture of the spleen: ultrasound patterns, diagnosis, and follow-up. Br J Radiol. 2003;76(910):704-711. 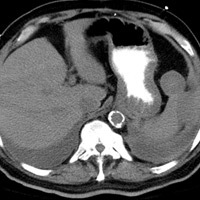 Blakenship JC, Indeck M. Spontaneous splenic rupture complicating anticoagulant or thrombolytic therapy. Am J Med. 1993;94(4):433-437. Hiraide A, Yamamoto H, Yahata K, Yoshioka T, Sugimoto T. Delayed rupture of the spleen caused by an intrasplenic pseudoaneurysm following blunt trauma: case report. J Trauma. 1994;36(5):743-744. Sugg SL, Gerndt SJ, Hamilton BJ, Francis IR, Taheri PA, Rodriguez JL. Pseudoaneurysms of the intraparenchymal splenic artery after blunt abdominal trauma: a complication of nonoperative therapy and its management. J Trauma. 1995;39(3):593-595. Görg C, Cölle J, Wied M, Schwerk WB, Zugmaier G. Spontaneous nontraumatic intrasplenic pseudoaneurysm: causes, sonographic diagnosis, and prognosis. J Clin Ultrasound. 2003;31(3):129-134. Hagiwara A, Yukioka T, Ohta S, Nitatori T, Matsuda H, Shimazaki S. Nonsurgical management of patients with blunt splenic injury: efficacy of transcatheter arterial embolization. AJR Am J Roentgenol. 1996;167(1):159-166.